Who is the Greatest and most Authoritative Church Father of All Time?! Topic: Who is the Greatest and most Authoritative Church Father of All Time?! This may be blasphemous (Lord have mercy on me if it is! ), but who do you think is the greatest and most authoritative Church Father (or fathers) in the history of Christianity? Please give a short explanation why you think the way you do. Re: Who is the Greatest and most Authoritative Church Father of All Time?! Our Lord, God, and Saviour Jesus Christ the All-Merciful master and creator of the cosmos, the second hypostasis of the Most-Holy and All-Glorified Trinity *takes a deep breath* wasn't exactly an option, but thanks anyway! Pope St. Athanasius the Great. He summed up all that went before, and provides the basis of all that has followed. No, otherwise the Apostles would definitely be at the top of the list. Wow, I think we just found our basis for unity. Evacuate the website!! This is not a drill! This is not a drill! He is a divisive figure, even amongst only EO. I would agree with those who have said St. Athanasius the Great. St John of Damascus - Father, hymnographer, defender of icons, the man with an answer for everything. LOL. I agree with all of the above, but St. John's answer for the OP would be Pope St. Athanasius. I feel sorry for him. It must be awfully boring to spend eternity in Heaven knowing that your best friends are heretics while your own kinsfolk refuse to play with you. He must play all by himself. Poor old Augustine. It must be awfully boring to spend eternity in Heaven knowing that your best friends are heretics and your own kinsfolk refuse to play with you. He must play all by himself. I was tempted in the same manner. Sorry, but his writing on reading and understanding are beautiful and elegant elaborations of a true reader and hermeneutics of the heart. ST. Augustine will always be close to me for that alone. The more I read. The older I get. The more I love this man. I feel sorry for him. It must be awfully boring to spend eternity in Heaven knowing that your best friends are heretics and your own kinsfolk refuse to play with you. He must play all by himself. Yeah! Although his Trinity-ology could use some tweaks, his confession was very moving. I always liked him. 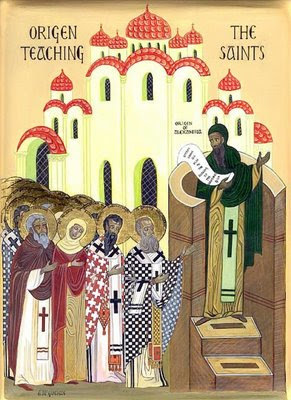 St.Athnasios the Champion and Pillar of Orthodoxy! St.Athnasios defender of Orthodoxy Against the world! ehm..If I were allowed to name all orthodox children, I would name them All Athnasios and Athnasia! No, I think he plays well with others. Despite a little razzing from Pope St. Athanasius, St. John Damascene, St. John Chrysostom and the rest of the gang, I'm quite sure he is at home among the saints. But then, would they all have to have nicknames or different middle names to tell them apart? How would they be on a bowling team? YHWH is the only & greatest Father of the church. Actually, you've stated an Eastern Orthodox truth! God is our only Father, Master, teacher, and bishop. Any man who has these qualities has them only in virtue of his partaking and being gifted of God's one Fatherhood. All that any of us have, we borrow from Him. What do you call the man who (hopefully) was married to your mother? Or are you claiming she was a virgin too? "I write not these things to shame you, but as my beloved sons I warn you. For though ye have ten thousand instructors in Christ, yet have ye not many fathers: for in Christ Jesus I have begotten you through the Gospel" St. Paul, Early, 1st Century, Christian. Since you cannot call the Church your Mother, you cannot call God your Father. The God of our Fathers (Acts 3:13). We've already been through this on another thread, he thinks the Apostles rampantly disobeyed Jesus on this point. I wish we had writings of Saint Nicholas of Myra. He must have had a fascinating mind. What do you want from a Judaizing heretic, cut off from Christ and His Church?